Aston Martin CEO Dr Ulrich Bez has made history by driving the first ever zero CO2 emissions lap in an international motor race in the manufacturer’s #100 Hybrid Hydrogen Rapide S race car at the 41st ADAC Zurich Nürburgring 24 Hours. 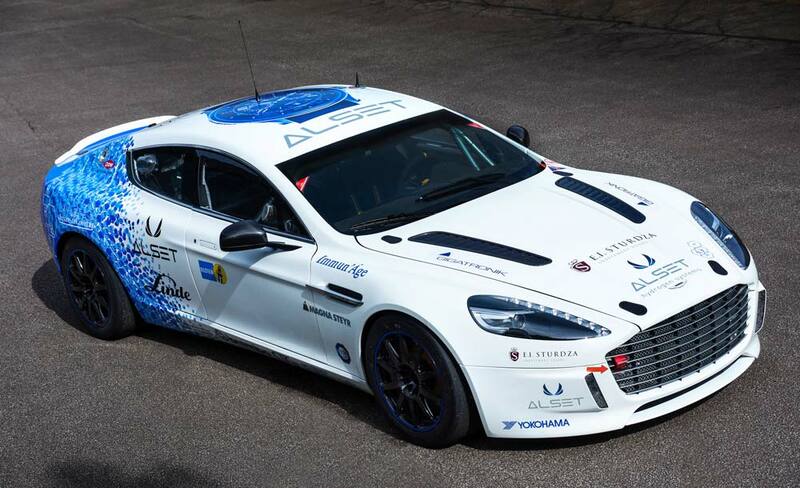 The 6.0-litre V12 twin-turbocharged prototype – based on Aston Martin’s new four-door, four-seat, naturally aspirated Rapide S – was developed with the support of renewable energy experts Alset Global to showcase Aston Martin’s commitment to engineering innovation in its centenary year. During the gruelling 24-hour endurance race, which starts at 17:00hrs CET on Sunday (19 May), the Hybrid Hydrogen Rapide S racer will run on a blend of gasoline and gaseous hydrogen, but the intention is that it will complete at least one lap in each stint on pure hydrogen.